Before the University of South Dakota’s Coyotes moved the ball down the field to win its 2017 Homecoming match-up against Youngstown State, Fiegen Construction was charged with moving a different ball to the goal line. 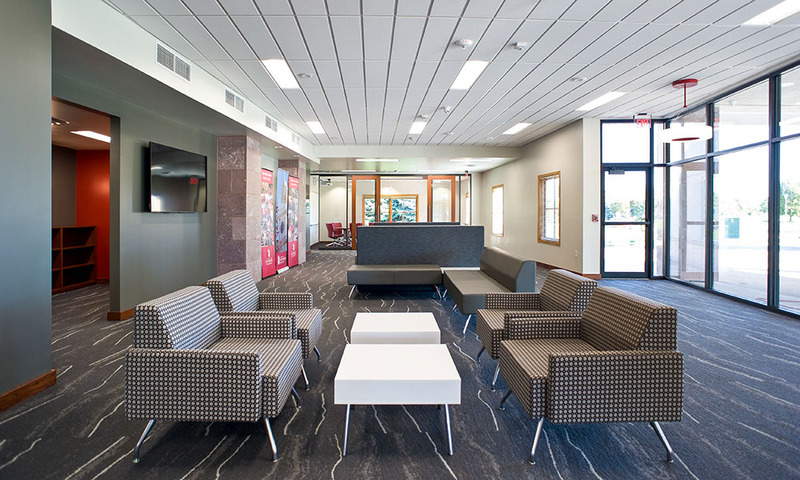 The University of South Dakota Foundation asked the Fiegen design-build team to complete interior and exterior renovations to the Foundation’s Wagner Alumni Center, home to both the foundation and the USD Alumni Association. The $1.3 million project encompassed a total interior renovation, along with many exterior upgrades. The project called for all new finishes, new LED lighting, and new duct work. 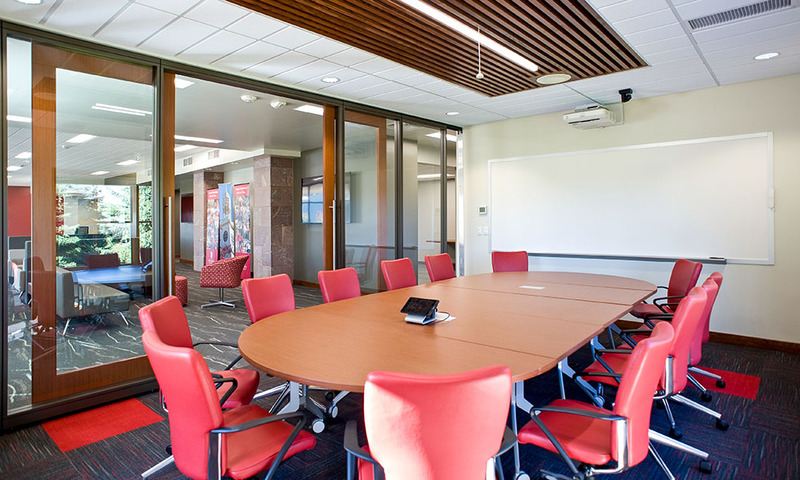 Opening up the center’s Great Room to provide a feature wall was an inspired idea, providing an aesthetic focal point. Exterior work included the design and construction of jasper stone columns as well as wainscoting which brought the building into congruity with the look and style of other buildings on campus. A new backlit glazing system around the canopy and cupola was also installed, to create a stunning visual effect. The Fiegen crew also opened up the front façade by demolishing one wall and installing new storefront glazing. Construction work began April 17 and was completed on time and within budget by September 22. That was more than a week before thousands of people flooded the campus for USD’s famed Homecoming “Dakota Days” parade and festivities, time-honored events recently extolled by USD’s most famous graduate, longtime NBC anchor and managing editor Tom Brokaw. “Dakota Days” attracts many alumni, donors, parents, and friends to the campus in Vermilion and was an excellent showcase for the newly-renovated Wagner Alumni Center. Since 1922, the University of South Dakota Foundation has provided generous private resources to the university to increase the excellence of its students’ educational experiences. Since 2014, Onward: The Campaign for South Dakota, headed by president and CEO Steve Brown, has raised more than $250 million in donor funds for the state’s flagship university. Through the generous support of alumni and friends, the success of the campaign has led to numerous campus improvements, close to 250 new scholarships to attract outstanding students, additional faculty support, and enrichment programs that provide research and travel opportunities for students and faculty. Fiegen Project Superintendent Duane Beck, Project Manager John Schaefer, and Architect Lucas Fiegen, AIA, handled a multitude of challenges, including rallying engineering expertise for the exterior glazing system. Structural engineer Mark Smith of Structural Engineering Associates (SEA, Inc.) played a pivotal role in creating successful innovations. 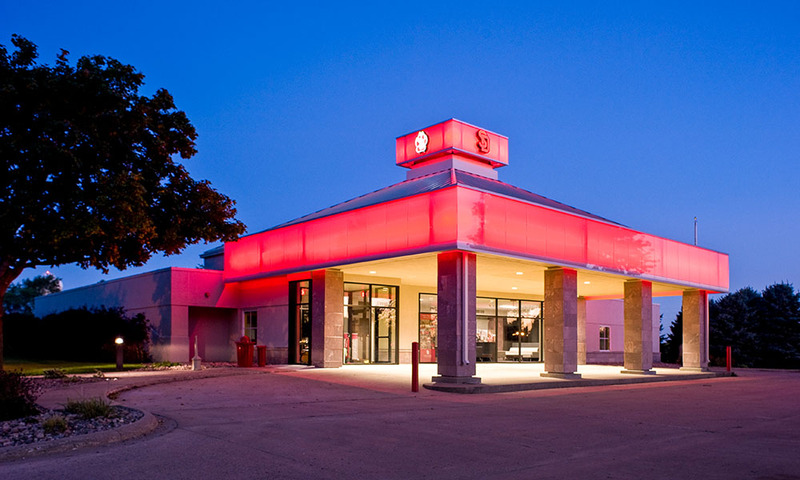 Despite a tight schedule and inevitable unforeseen issues, Fiegen was able to navigate a tricky water infiltration problem, replace failing ductwork, and tediously remove old wall coverings in preparation for new interior paint and finishes. Earning accolades from our clients is important to Fiegen Construction. We are pleased that the foundation is happy in its re-envisioned building.